In a rare event, Aruba and Curaçao were rocked by an earthquake for the second time in two consecutive days. Last Thursday morning’s earthquake had a magnitude of 4.8 on the Richter scale. This morning’s earthquake was a lot stronger with a magnitude of 5.5 and could be felt on both Caribbean islands. More destructive earthquakes typically have magnitudes between about 5.5 and 9.0. The Richter scale is logarithmic; a difference of one point results in a thirtyfold difference in magnitude. In Willemstad, on the island of Curaçao, located 70 miles southeast of Aruba, a hardware store had to be evacuated after several product shelves came down, Radio Dolfijn reported. In Aruba, customers were ordered to leave stores as well. No further major damage has been reported. Both earthquakes took place between Venezuela, Curaçao, and Aruba. 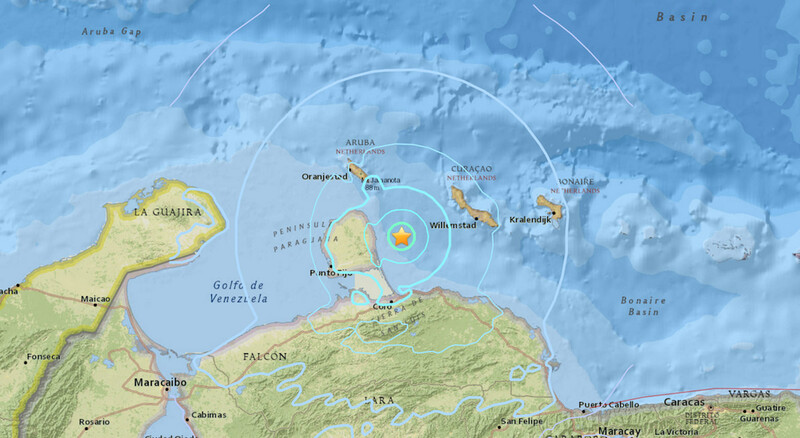 The quake’s epicenter was located about 54 kilometers north of La Vela de Coro, Venezuela at a depth of 10 kilometers. The quake was felt as far as Caracas, the Venezuelan capital. Leon Pors, who works as a geologist at the Curaçao Footprint Foundation, explains that Aruba is located on the Caribbean Plate, which borders the North American Plate, the South American Plate, the Nazca Plate and the Cocos Plate, and slowly moves toward Suriname. On these borders, seismic activity including earthquakes and volcanic eruptions, are not unusual. Mr. Pors expects even more seismic activity in the region.